Pasture Living: Where to Buy Cold-Pressed Extra Virgin Coconut Oil in Singapore? A number of people asked me where is the best place to buy cold-pressed extra virgin coconut oil. Many organic stores in Singapore sell them, but they cost a fortune for just a small bottle. I've been buying mine through Vitacost and it so happens I have relatives who live in the US who are willing to bring them back to Singapore every time they visit. 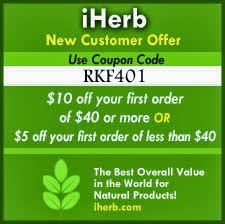 A while ago I came across iHerb, another US-based online store that sells more 35,000 natural products including skincare and food products. And what differentiates them from Vitacost is that iHerb ships internationally, including Singapore, for a very reasonable price. It costs just $4 for direct delivery through Singapore Post for weight up to 10 pounds (4535 grams) and value up to $200. And it takes just 4-8 business days, with tracking number. So, if you are still wondering where to get your cold-pressed extra virgin coconut oil, you can now buy it through iHerb. I recommend NOW coconut oil. It costs US$29 for a 1.6 liter coconut oil and if you're first time customers, you can use my affiliate code RKF401 to get $5 off $20 purchase or $10 off $40 purchase. You can read my post about the health benefits of coconut oil here and how we can use it to nourish our skin here. Do you know any other place in Singapore that sells cold-pressed coconut oil for a reasonable price? Hello Victoria, just wanted to check with you does the extra virgin coconut oil from nutiva have an aroma? how does it smells like? Alternatively, there is also the one from Country Farm / Cosway which is much cheaper at $28 if i am not wrong, also from Philippines. You can get it at http://simplemillfarms.com/. Including coconut butter and sugar.